As a speech-language pathologist in the field of augmentative and alternative communication (AAC) since 2001, I’ve experienced working with different disciplines and in many different contexts. Many times, when I visit schools as an AAC consultant, school-based SLPs and other school staff report carryover in AAC from school to home as their biggest challenge in helping a student become a more independent communicator. Why is facilitating carryover such a challenge? I found one important factor to be parent or caregiver training. Often, SLPs and educators include parents in deciding what AAC system to use, but not in training and implementation. Various barriers make including parents in AAC training difficult—no time for staff to train parents, parents can’t come to school during the day, a language barrier, other scheduling issues and more. Without training, parents often feel overwhelmed or confused by the system and therefore don’t use it efficiently for communication. So, where can we as SLPs start to include and provide parents with AAC training and improve students’ carryover of device use at home? Starting parent training early! When evaluating preschoolers for AAC systems, I recommend parent trainings as part of my assessment. The unofficial training begins from the day that we first speak about their child and continues as the child begins to learn their AAC system. Even when the training ends, I stay in touch with parents as questions come up, as well as to hear their concerns and follow the child’s achievements. Plan for two or three sessions. Parent training for AAC generally is not a recurring service. Usually, just two or three sessions provide sufficient training, but I base this on family needs. I also make sure parent training gets included on the child’s IEP. Training in the child’s home rsults in highest levels of success. Being in the child’s environment allows you to see where communication opportunities and challenges occur. For example, in a child’s kitchen I can create communication opportunities based on the particular environment, such as asking a parent to model, “I would like dinner now.” I also use various strategies, such as moving favorite snacks to a higher shelf to create a communication opportunity. Focus on the parents, not the child. Generally, the parent trainings are for parents or caregivers and not for the AAC user. However, you might include the child to demonstrate specific strategies, such as modeling and prompting hierarchy. Other times, working alone with parents allows you to teach programming, explaining concepts or strategies, and discuss any challenges without the child present. I tailor this approach for each situation. Keep your agenda flexible. Don’t go into a home with a fixed agenda. Generally, I begin by reviewing the AAC system, core and fringe vocabulary, and teaching simple programming—editing a button or adding photos. Do make sure to discuss how to set up the system. I also cover why left-to-right sentence structure and the difference between core versus fringe vocabulary are important concepts to understand. Focus on implementation as the key goal for parents. What motivates the child in the home? What family traditions or regular outings can I use to focus training? For one family I worked with, the parents and their child loved going to Shoprite together. I worked with them on various communication opportunities this daily outing provided. I also ask families if they recently went on vacation. This lets me show them how to create a story on their child’s communication app/device so that he/she can retell their travel experiences at school. Reviewing communication functions, modeling and aided language stimulation is also a key part of the training. Don’t feel intimidated and be yourself! Often, I meet SLPs intimidated by parent trainings because they lack experience. I use the “follow the parents’ lead” strategy in helping make their child’s AAC system as successful as possible. It’s about connecting with the parents, learning their concerns and where communication breakdowns occur, and helping them facilitate communication with their child. I also strongly encourage remaining empathetic—especially with parents of young children who are just learning about their child’s complex communication needs. We need to feel compassion but also encourage parents to feel confident in their abilities to facilitate communication. Review dos and don’ts of AAC. Although I don’t have a strict agenda, I always review specific dos and don’ts that parents might already know, but are worth going over anyway. Turn restrictions on! With the world of YouTube and other technology distractions, I train parents on restrictions for using an AAC device. A child’s time watching videos or playing games with the iPad hosting the communication app can affect progress at home and in school. Help parents set up Guided Access to limit the device to accessing only the AAC app and avoiding distractions! Stay in touch. After parent trainings, I stay in touch with parents for many years. I’ve kept in touch with some parents for almost 15 years! Going to someone’s home to provide support for families of children using AAC may seems overwhelming. 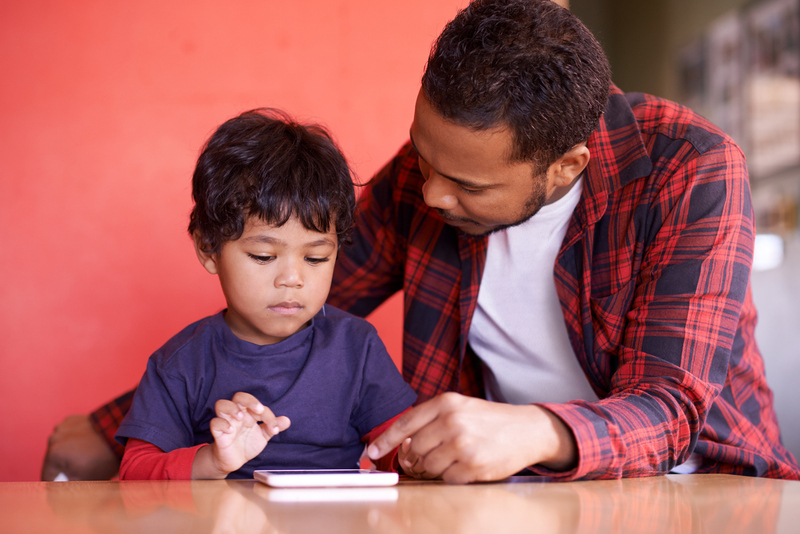 But just a few sessions with parents or caregivers—and letting them know you’re available for future support—can take little time for a great reward in the child’s successful use of AAC. How do you make sure parents get the AAC training they need to ensure their child’s communication successes? Please share your insights and strategies in the comment section below. June is Aphasia Awareness Month—Join the Celebration! When the author wrote 2-3 sessions, I wondered how long each session would be? Parent training is so important. When I do trainings for school districts I try to get them to invite parents. It just isn’t always possible. But so, so needed!